You so busted me when you called out the FlyBabies who won’t use their purple rags so they won’t get messed up! Oh yeah, mine are only 3 weeks old and I want to keep them nice. After 2 or 3 more emails where you called me out again, I finally started using them, but only to clean up the “cleanest” messes. You know, water drips on the counter top. Wipe out the clean sink. I didn’t want permanent stains and spots on these babies. I was also afraid that once I tackled a dirty job, that rag would be “used up” until it went through the wash. How was I going to make it with only 3 rags in a day? Isn’t one supposed to stay dry all the time to polish off whatever the wet one just did? My counter was getting cluttered withmy hierarchy of various rags and dishtowels: new purple, bleached white terry, waffle weave, embroidered dish towel, and plain dish towels. Every caste had its own job and designated territory. Then another FlyBaby said she used purple rags to clean her grill. I’m thinking “You haven’t seen my grill and I’m not messing up my pretty rags,” but I’ve been using them on dirtier and dirtier projects. Wow, they rinse out great, ready for the next task all day long. Yesterday I tackled the roasted-on gummy grease inside the microwave door. As advertised, they did an amazing job with just water and a better job with Windex. The gummy stuff rinsed off the rag in soapy water, but there were still a few dark spots staining the purple. I thought this would have to be the designated Cinderella rag for dirty jobs, while her two 2 fancy sisters were for kept for special light duty. Well guess what!!! After Cinderella went for quick spin in the washer, she came out as spotless as the other two! So today we knocked out the George Foreman AND the outdoor grills – in quick order, too!!! I feel like Super Woman, fighting grime with a rubba scrubba and purple rags. There aren’t spots on the rags either except one, and now I know that after the quick wash cycle tonight, I won’t will be able to tell Cinderella from the Belle of the Ball. I confess I also ordered 3 more rags the other day, which made it easier to let go and use the ones I have. You know, hedging my bets. LOL! I’m adding “wash the microfiber rags” (all varieties – blue mop cover, etc.) to the evening routine so everything is fresh and ready to go in the morning. The short cycle is perfect, with a splash of detergent and vinegar. My white bar towels should be nervous. The new ones used to be the special ones for shining the sink and the older ones were the workhorses throughout the day. They may be decluttered soon in favor of Purple Rags – OUT OF THE BAG! Who knew all this stuff could be so fun AND FAST. I was trying to put off cleaning the outdoor grill ’til Wednesday – anti-procrastination day. Now it looks like I’ll have to face the last paper stronghold. Do you think the Clog Cannon might work? Ha ha. Thank you, FlyLady. Now I really do wake up each morning looking forward to taking care of my home. It’s coming together. FlyLady here: Please don’t save your rags! Use them and tell us all about it! They are motivating! 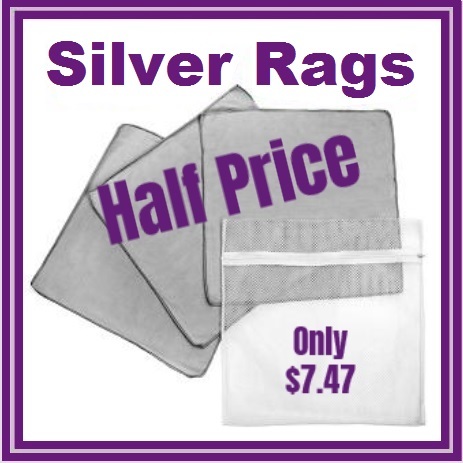 Our Silver Rags are half price right now! Same great rag! This entry was posted in testimonials and tagged Purple Rags, silver rags. Bookmark the permalink.